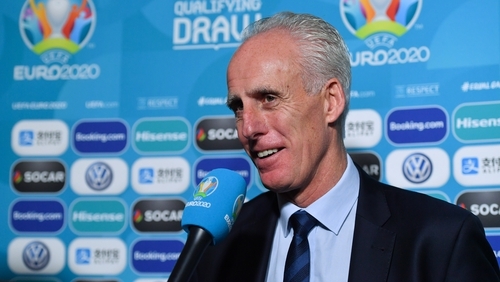 In what has been a hectic week for Mick McCarthy, the new Ireland manager came out of the Euro 2020 qualifying draw delighted to have something "tangible" to work with. Returning for his second stint in charge of the national team, McCarthy spent his first week in the job watching games, compiling reports and feedback, while also fulfilling a long list of duties in the build-up to Sunday’s Dublin-hosted draw, which also included a reunion with the heroes from Euro ‘88. And finally, McCarthy arrived at the Dublin Convention Centre for the UEFA Euro 2020 qualifying draw on Sunday morning, before finding out Ireland’s opponents for the upcoming campaign that will take place throughout 2019. "It feels like I am doing the job now, because now we have got something tangible," said McCarthy, speaking to the media following the draw. "At least I know what teams we have, I can watch the players, I can watch past games and just get down to planning." Ireland will now take part in a group of five, with top seeds Switzerland, old foes Denmark, Georgia and Gibraltar, both having recently been in qualifying groups with Ireland, Georgia twice. But things could have been a lot different for Ireland, only for a UEFA ruling which prevented McCarthy’s side from sitting in a group alongside Germany and the Netherlands. "I laughed," admitted McCarthy, in relation to initially getting picked out to play in Group C alongside the Dutch and the 2014 World Cup winners. "It’s like the old cliché 'group of death'. I laughed, because I was fully expecting to be in that group, being Sod’s Law, that you think you will get it. "And then because it’s in Dublin, somebody will be thinking there was some skulduggery going on somewhere. "I don’t know why, it was like someone with their magic fingers on the lap-top shifted us. And there was a collective sigh of relief." Skulduggery, of course, could not be levelled at UEFA on this occasion, as Ireland were never going to remain in a group with two other host nations, a rule that was abundantly clear ahead of the Dublin draw. McCarthy, however, was prepared to accept whatever scenario the UEFA draw handed Ireland and said that the thoughts of playing in the group of death brought him back to the successful World Cup campaign for the 2002 World Cup in Japan and Korea when Ireland qualified for the finals out of a very tough group. "I was thinking about when we qualified for the World Cup, we had Portugal and Holland and everyone had written us off, and we didn’t lose against either of them." So on to the qualifying campaign, as Ireland will begin with two matches in March, before completing the other six games throughout the international weeks pencilled in throughout the year. On reflection, McCarthy accepts that while they have avoided two traditional European superpowers, the top two seeds in the group will provide very difficult challenges for Ireland. "It was a bit of a premature sign of relief avoiding Germany and Holland, when you have Switzerland and Denmark in the group," pondered McCarthy. "Switzerland, I think, are one of the best teams in Europe at the minute and Denmark, have been our nemesis, knocked us out of the [World Cup] and then [won our group] in the Nations League." And while Ireland have played four of the five teams in recent years, the draw also handed McCarthy a link to his previous tenure, albeit a negative one - Ireland were beaten by the Swiss at Lansdowne Road in October 2002 in what proved the manager’s final game in charge. "I didn’t lose too many competitive games at home at Lansdowne and that was the last one, so it was a disappointing way to leave," said McCarthy. "But it gives me a chance for revenge, doesn’t it? McCarthy believes that Georgia were the strongest team in Pot 4 and would prove "a tricky proposition", knowing that Ireland struggled to dominate them in the last two campaigns, despite winning three and drawing once against the perceived weaker nation. "I know that we have played them recently and I was chatting to Kevin Kilbane and he said what a good side they were, and I think that was probably one of the toughest ones in Pot 4, but then we missed Azerbaijan and we ended up with Gibraltar." As the fixture lists were being discussed and divvied up by the five association representatives, McCarthy did admit that he had been thinking a lot about his first game in charge, which will be a competitive fixture. The new manager had spoken about the importance of not losing your first match, while also adding earlier that he would like to start with a winnable game. But what McCarthy is really looking forward to is an emotionally charged occasion at a packed Lansdowne Road. "I’ve been giving that some thought," said McCarthy. "Do you want a game that you think that maybe you can win? And if that is the case, everyone will be looking at the last team, Gibraltar. "But what if you go there and it is on a plastic pitch, who knows? "I’d like a full house. I’d love it to be a big game. "At the moment, there is a bit of positivity coming back, so get the crowd behind us, it would be great if we could win the first game, it would be vitally important." While the UEFA 'draw rules' saved Ireland from that potential group of death, it also helped to keep the air miles down considerably as fellow host Azerbaijan were moved elsewhere, with Gibraltar coming into Group D.
As a result, Ireland only have one major excursion throughout the campaign, again to Tbilisi, while the other three games are short-hops around Europe to Copenhagen, a Swiss city, perhaps Basel, and the south coast of the Iberian peninsula. "I know Georgia is a fair old trip and I believe there is a three-hour time difference so that always makes it unusual conditions to play, and not easy if you have to travel great distances," said McCarthy. "So the fact that we are not going to have to go to Azerbaijan, which is even further away, it does help and I am sure that Denmark and Switzerland feel the same way." McCarthy is now into his eighth day in charge of the national side, and kicked things off last Sunday with the well-publicised phone call to Declan Rice’s father. The manager then returned to England and began the process of ground-hopping to watch the current squad playing for their clubs, while also attempting to unearth some new recruits, before returning to Dublin for the Euro draw schedule. "I went to watch Brentford-Sheffield United on Tuesday, having got back Monday, I went to Millwall on Wednesday," said an enthused McCarthy. "Terry Connor went to watch Villa, and he went to watch Birmingham-Preston yesterday. "I had somebody at Reading so we’ve looked at games. Of course we have." As it happens, the manager did not have time to catch Southampton’s 2-2 draw with Manchester United on Saturday, where Michael Obafemi started his first Premier League game for the Saints, and made a significant contribution, setting up his side’s first goal following some composed play inside the United box. But McCarthy is hopeful that the Irish teenager can remain involved with the Southampton first team over the coming months to allow him to add to the list of Premier League players available for selection. McCarthy also took time to pay tribute to Martin O’Neill for handing the striking prospect his first competitive cap for Ireland, in what turned out to be the former manager’s last game in charge. "We might be looking down the line and lauding Martin O’Neill for doing that because there’s not that many (Irish) strikers around in the Premier League, and a young one. "He played well yesterday, apparently. I didn’t see the game – I was doing other things here. "I’m delighted. I hope he stays in the team and develops into a Premier League footballer that I can pick from in March."